Dual Shower Heads are the way to go when you're looking to add a second shower head to your bathroom. 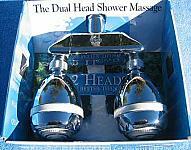 We offer 3 different types of dual shower heads that will rock your world. The dual Arm Shower Head sets position 1 shower head at the wall like a normal shower head installation with the 2nd shower head out on the end of a double extension arm that can be adjusted up, down and/or out. 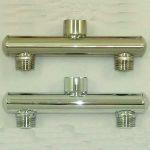 Putting 2 shower heads on your existing shower pipe is simple and easy to do. Most customers will have plenty of water pressure to run both heads at the same time but with reduced flow to each since since you are splitting the water between them. We recommend using flow valves behind the shower heads so you can control the amount of water flowing through each shower head. The way you can increase the water flow to one head thereby getting a stronger spray from that shower head. Another option is to install a regular shower head and a slide rail and/or handshower. 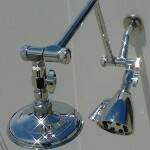 Use a diverter valve to direct the water through the shower head or the handheld shower. 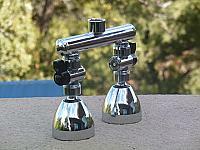 For existing plumbing, use a diverter valve that simply mounts on your shower arm pipe right behind your shower head. Don't see the shower heads you wanted with our dual arms in a set? Email us and we'll let you know if it's possible.